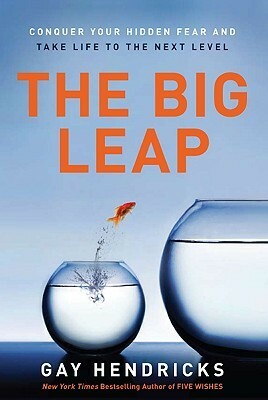 I’ve just finished “The Big Leap” by Gay Hendricks. If the title doesn’t ring a bell, the cover might: It’s a goldfish jumping from one (tiny) aquarium to the next (bigger) one. Exactly, making “the big leap”. I had seen the book at the bookstore a few times but the cover always put me off. Come on, a goldfish? Oh was I wrong. It’s a fantastic book, and I had to completely change my mind about it. Why are we not making the leap? Why are we not grasping an opportunity when it presents itself? Why are we keeping ourselves small? Why are we sabotaging our lives, just when everything seems just oh-so-perrrfect? The false belief that we are fundamentally flawed – we sabotage our success because we think we are essentially bad. And good things can’t happen to bad people. The false belief that by succeeding, we are being disloyal to and leaving behind people in our past. We sabotage our success because we think we’re being disloyal to our roots. The false belief that we are a burden in the world. We sabotage our success in order not to become bigger in any way (= an even bigger burden). The false belief that we must dim the bright lights of our brilliance. We don’t want to outshine someone in our past. We sabotage our success by holding ourselves back. The author says that not all of the above will apply, but one or two patterns will be recognised by virtually everyone. These patterns will show up as soon as we are reaching our upper limit of happiness and success, therefore prompting us to sabotage ourself (you won’t be surprised to learn that he thinks the thermostat – where our felt upper limit is – has been set very early on in life). I seem to be a mix of category 2 and 4. I always feel guilt when something exceedingly exciting and elating happens to me (and even worse when I’m the driving force behind). There’s a sense of not deserving it because there are so many other people in know or knew who deserve to be successful, happy and to be able to follow their dreams. I feel guilt about grasping opportunities because I think I’ve come across so many others who are more suited, qualified or deserving. I don’t want to take anything from anyone. I don’t want to steal the chunky bits from someone’s plate. But here’s the thing: By not grasping, not reaching, not going for it – I am NOT creating any opportunities for others. The project, the idea, the inspiration, it all deserves to be brought into this life, and if we’re given the opportunity it means we’re meant to GO FOR IT. By withdrawing, not putting ourselves out there we’re not helping out those ones who we believe should go for it. WE’RE SIMPLY LETTING IDEAS, PROJECTS AND DREAMS DIE. These other people may have their very own barriers that are holding them back – but by succumbing to ours we’re not tearing down theirs. How do you feel about the 4 points above? Do you recognise yourself? I definitely see myself. I’ve been working through the first my whole life!